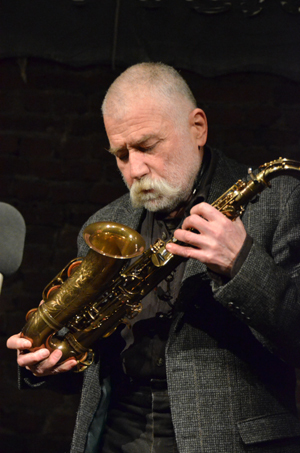 Artist and musician Peter Brötzmann is one of the most important European representatives of contemporary improvised music, whereas his visual art production is less known to the public. present day, occasionally exhibiting in both Europe and in the U.S.
His retrospective show at MGLC, the first in Slovenia, showcases the author’s works on paper - drawings, prints and watercolors, some paintings and objects, as well as record sleeves and posters. The exhibition is a visual introduction to the 54th Ljubljana Jazz Festival, at which Peter Brötzmann is a regular guest, and is organized in cooperation with Cankarjev dom. Peter Brötzmann as seen through the lens.